NAMCO BANDAI Games America Inc. today released new screenshots from the “GAC Pack” downloadable content for Dead to Rights®: Retribution, a ground-up reinvention of the multi-million unit selling crime action series developed by Volatile Games. The “GAC Pack” will include two new completely different modes of gameplay as well as exciting bonus options to enrich the player’s experience with the core retail game. “Assault on the 87th Precinct” is a new mission that reveals a flip side to the story, allowing players to experience the action from the GAC (Grant City Anti-Crime) enemy’s side of the battle. Players step into the boots of the GAC Sniper, Brawler and Tank characters as they converge upon the GCPD (Grant City Police Department) stronghold under orders to contain all police officers so they can secure a tactical advantage. In “Riot Control Mode,” Jack and Shadow fend off increasingly difficult waves of GAC forces to earn points and achievements based on speed and style, with high score bragging rights on international leaderboards. 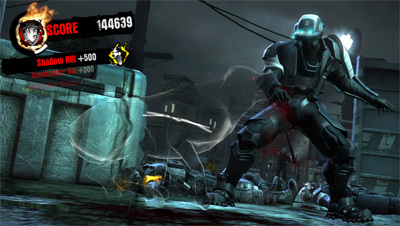 In addition, the previously exclusive “Jack Pack” and “Shadow Pack” are also included in the “GAC Pack” allowing players to access armor for Jack, stealth camouflage for Shadow, an “action mode” with explosive rounds gunplay, and a “noir mode” with a black, white and red graphic filter. Developed by Volatile Games, Dead to Rights: Retribution is rated “M” for mature audiences by the ESRB and carries an MSRP of $59.99. The “GAC Pack” DLC add-on content will be released on June 1 for Xbox LIVE Marketplace for Xbox 360 for 400 Microsoft Points and on PlayStation Network for $4.99. Players must have the retail game in order to access the “GAC Pack” content. Tiger Woods PGA TOUR 2005 challenges gamers to take on the man who has changed golf forever—Tiger Woods. The revolutionary new Tiger-Proofing course alteration technology will change the way gol..